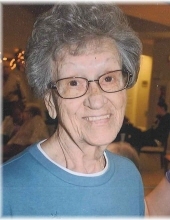 Betty June Eichman, 86, of Crete, formerly of Grand Island, passed away Wednesday, February 6, 2019 at the Gardens of Crete, Crete, NE. Funeral services will be 2:00PM Monday at Livingston-Sondermann Funeral Home with Pastor Trudy Kenyon-Anderson. Visitation will be one hour prior to service. Burial will be at Westlawn Memorial Park Cemetery following the service. Betty was born February 27, 1932 at Franklin County, NE to Cecil and Verdia (Schriner) Jackson. She attended Riverton and Franklin Public Schools. She spent her early years on the family farm attending to usual farm chores and activities. She was married and had three children: Steve, Angie and Kevin. She moved from the farm and worked factory, restaurant’s, and public schools until her retirement. In June 1968 she married Harvey Eichman at Minden, NE, to this union her family grew by four children: Bob, Kathy, Jeannie and Jerry. Together, they enjoyed camping, traveling, country concerts and dancing. Betty was a member of several organizations and clubs including, VFW, Cooties, the Eagles Club and the American Legion. She enjoyed reading, playing cards and games with her children and grandchildren. She loved playing jokes and pranks on others. On Saturdays you could find her out going to garage sales and thrift shopping, especially for books. She loved all types of animals and had a special fondness for her dogs. Those left to cherish her memory are her children; sixteen grandchildren; twenty-seven great grandchildren; five great great grandchildren; sisters, Janice, Shirley, Christine; and numerous nieces, nephews and other family members. Betty was preceded in death by her husband Harvey in 1994; her parents; daughter, Angie; son, Steve; a sister; and brother; son-in-law, Bob; and three brother-in-laws. Family requests that those attending dress casual. Memorials are suggested to the family to be designated at a later date. Online condolences may be directed to www.livson.com. Livingston-Sondermann Funeral Home is entrusted with arrangements. To send flowers or a remembrance gift to the family of Betty June Eichman, please visit our Tribute Store. "Email Address" would like to share the life celebration of Betty June Eichman. Click on the "link" to go to share a favorite memory or leave a condolence message for the family.